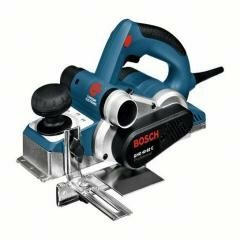 The highest surface quality due to ultra-sharp blades and constant speed, even when working in hardwood. The fastest and least expensive blade changes on the market due to durable Woodrazor reversible blades and the easiest possible adjustment. The longest lifetime due precise aluminium bearing seat and thermodynamic motor protection. Easy, precise and clearly legible depth of cut setting. Comfortable working due to chip clearance to left or right, as desired. 3 V-grooves for easy and flexible chamfering. Workpiece is protected thanks to parking rest. Lock-off switch for left-handers and right-handers. Planing blade and key depot. Handle and guide handle with softgrip. Complete with all accessories (tungsten carbide reversible blade, rebating width guide, rebating depth guide).